Youth Climate Action is a group of volunteers from across the world, who have strong knowledge on climate change negotiations and have decided for the UN Climate Summit to launch a virtual platform to give more visibility of how young people around the world are actually fighting climate change. Young people are not only the most vulnerable and largest population affected by climate change (UNICEF, 2014) but we are also agents of change, and this is the time to raise world awareness of who we are and what we do to fight climate change in our countries. 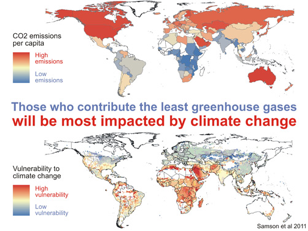 Climate change threatens to disrupt the weakest economies and disadvantage the poorest people in developing countries, African continent is the least emitter of green house gas but yet, the continent is the worst affected by climate change (Samson et al 2011). In the absence of concerted global actions on climate change, the IPCC estimates for the first time in its last report that the sea level could rise by one meter over the next century. Large African cities will be submerged under rising sea levels; more than 40 percent of wildlife habitats could disappear (IUCN 2008). In today's modern world, Africa is reeling from climate change. Floods, famine, drought, food shortages are buffeting the vulnerable continent which lacks the resources to protect itself and this affects largely its effort to manage sea flow, lakes and open aquifers. Up to 70 million people per year could be at risk from rising sea level in Africa by 2080 from 1 million per year in the 1990s, this affect Africa's poorest. Up to 30 percent of Africa's coast could disappear as sea level rise from between 15cm to 95cm in the next 100 years (UNEP Africa Report Revised Version 2011). Important cities such as Cape Town and Maputo are at risk. For example, if sea level were to rise by one meter, part of Lagos, the economic nerve and epicenter of businesses in Africa's most populous country, Nigeria would be submerged. Climate change will lead to an increase in the loss of species and degradation of key ecosystems such as coral reefs, which play a critical role in the economy of most African countries, a displacement of millions of people, and potential flow of environmental refugees, less space per population displacement, the intensification of existing tension and crisis in most part of sub-Saharan Africa is as a result of climate change crisis therefore, the question is sequel to all these problems, how the youth are going to adapt to this changing climate. That is why Youth Climate Action volunteers engage in climate change movement beyond borders. As one of the co-founders of Youth Climate Action, we will evaluate campaign measures with other fellow youth, share knowledge on climate policy options that would be targeted at COPs, which will invariably equips us to improvise and contribute our own quota towards derisking future climate chaos, face challenges of the 21st century and know how to play our role in shaping an underground reservoir of climate campaign strategies that will transform our vulnerable economies, and serve as youth agents of addressing changing in climate worldwide. This post is part of a month-long series produced by The Huffington Post in conjunction with a variety of events being held in September recognizing the threats posed by climate change. Those events include the UN's Climate Summit 2014 (that was held Sept. 23, 2014, at UN headquarters in New York) and Climate Week NYC (Sept. 22-28, 2014, throughout New York City). To see all the posts in the series, read here.